UO ethnic studies professor Alaí Reyes-Santos made a major revision to the curriculum for her “Race, Ethics, Justice” course last fall: She added a trip to Puerto Rico. It was week three of the term and Reyes-Santos, a native Puerto Rican, was frustrated with the lack of federal aid in the aftermath of Hurricane Maria. It had been weeks since the storm devastated the island and there were still widespread power outages and severely limited access to potable water and medical care. 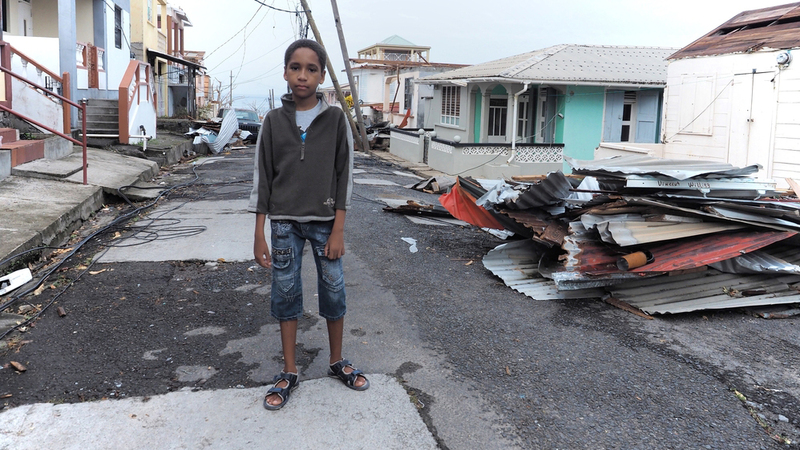 Through the lens of Hurricane Maria, students examined disparities in justice across different ethnicities, genders, classes, sexes, rural populations and other marginalized communities. As they dug into what was transpiring in Puerto Rico, they used their findings to consider how to ethically engage other racial, economic and environmental justice struggles in the world. The students produced a range of materials, including research papers, timelines, historical analyses, social media campaigns and blog entries. And the small group that participated in the trip contributed photographic, audio and written documentation from their visit to the island. The documentation of Puerto Ricans’ experience was a core component of the project and the primary reason Reyes-Santos wanted to travel to the island with students. With the help of support from the ethnic studies department, Associated Students of the University of Oregon and fundraising efforts spearheaded by the students, Reyes-Santos was able to make this a reality and spent several days in Puerto Rico observing relief efforts, interviewing residents and delivering 15 suitcases full of supplies to the island. To prepare students for this experience, Reyes-Santos hosted trainings on how to conduct respectful ethnographic research in a disaster area. That included how to interview a racially diverse group of subjects and how to ask questions in a way that’s considerate of the pain and the struggles people could be enduring in the wake of devastation. UO sophomore Bareerah Zafar was one of the students who traveled to Puerto Rico. Zafar is studying both ethnic studies and journalism because she hopes to find a career that lets her travel to places where people need help and find ways to share their stories — places like Puerto Rico in the aftermath of Hurricane Maria. Through the trip, Zafar was able to use her ethnic studies course to do the kind of storytelling that she’d eventually like to do professionally. She interviewed Puerto Ricans and compiled a photographic journey through the island, which are now published on the website and available for the public to learn from. Every student contributed to the project, regardless of whether they actually boarded a plane to Puerto Rico. It was not a hard sell to convince the students to amend their expectations and plans for the course. Reyes-Santos saw a huge surge in enrollment for the course in 2017, something she attributes to students’ desire to address heightened political, social and racial tension and violence in the country.